Try a B&B for a better way to stay! B&Bs are a better way to stay! You don't have to believe me - as an innkeeper, I may be slightly biased - but read this from Paul Brady, who writes for Gadling, an AOL Travel blog. 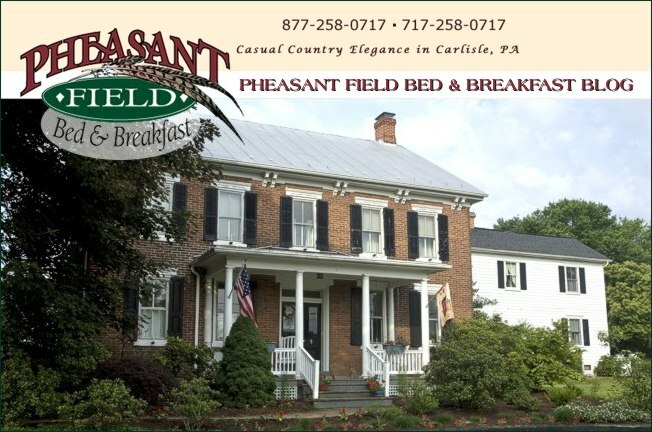 The B&B he describes in his blog post happens to have many of the same attributes as Pheasant Field Bed & Breakfast: country setting, horses grazing out back, birds singing, and a relaxing atmosphere. Paul also mentions many of the "freebies" that most B&Bs offer: internet access, snacks, beverages, and a "make yourself at home" feeling! I just love this comment from Paul: "But it took about three minutes at the Whistlewood Farm in Rhinebeck, New York for me to finally realize that the bed and breakfast is the world's greatest form of lodging." YES! Paul 'gets it'! If you have not tried staying at a B&B, read more about the experience and why you should give one a try. We would be happy to be your first B&B experience! Check availability now and book your stay with us. Summer is in full swing and Carlisle's best summertime festival is gearing up. SummerFair starts Wednesday, June 30th and continues until July 9th. There will be FREE fun events for 10 days! Check the schedule and make your plans to visit Carlisle, PA for SummerFair!